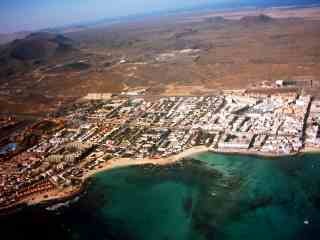 Corralejo is a tourist resort situated at the northern end of Fuerteventura. 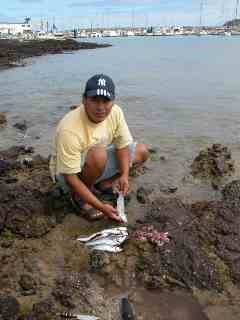 It is considerably larger than Caleta de Fuste and has a more touristy feel. 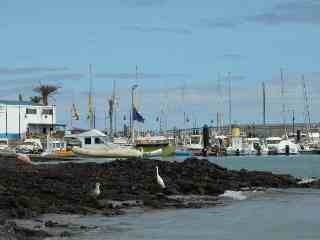 The original part of the town is based around the old harbour, which was used by local fishermen. Here the small sheltered beach, Playa la Clavellina, provides safe bathing for locals and holidaymakers alike. 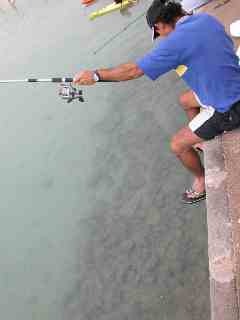 Fishing from the harbour wall is a popular pastime, and it is not usually as busy as the photograph suggests. 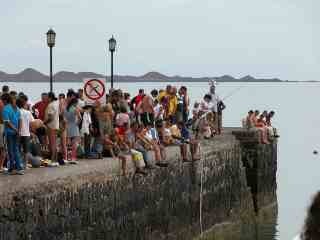 On this particular day there was a competitive swim from Lobos back to Corralejo, and people who had been visiting the tourist information office, as well as relatives of those taking part crowded onto the wall for a good view. The market is held on Tuesdays and Fridays close to the Baku water park.It starts about 9.30 and finishes about 1.30 depending on how busy it is. Here you will find a lot of crafts as people living on the island will turn their hand to anything that can make them a living. As well as clothes, shoes and household goods and souvenirs there is also a range of interesting African wooden crafts and artwork on sale. Why not haggle the price and get yourself a real bargain! A short distance south of the old port are a couple of more spacious sandy beaches that have fine views of the Island of Lobos. 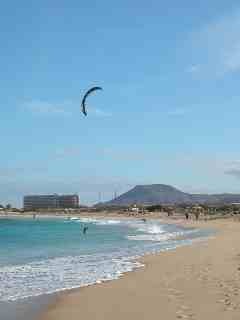 Whereas the small beach by the old harbour in Corralejo seems to making use of the space, these larger beaches are aimed at holidaymakers staying in the north of Fuerteventura, and have everything needed for a day at the beach on Fuerteventura. 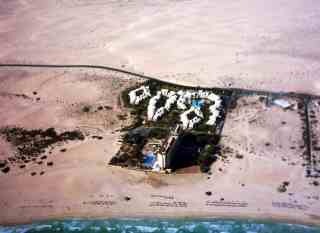 The town is surrounded by sand dunes and miles of sandy beaches that form a nature reserve. The beaches between Punta de Tivas and the Tres Islas hotels, called Playa del Pozo, Playa del Medano and Playa de Viejo run in to each other and this sandy shore is sometimes called Flag Beach. These beaches are exposed to the wind and this makes these beaches ideal places to pursue those activities that require a little more life to the water. Circular stone structures provide a windbreak for those that just want to take advantage of Fuerteventura's sunny climate. Some of these beaches, though it is really one long beach, are used by naturists. The attitude to naturism on Fuerteventura is relaxed and as such there are no designated naturist beaches. Naturists generally prefer to be on beaches that are away from the resort centres, so that they don't offend other bathers. The beach at Playa de Pozo seems to be the most popular with naturists. 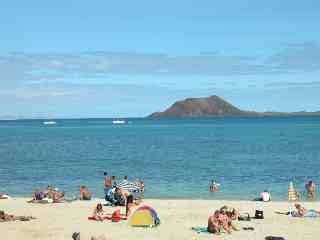 Transfer times from Fuerteventura airport to the holiday accommodation in Corralejo is about 4o minutes. You could also travel by bus, guagua, as they are known locally. This would involve taking a ten minute journey into Puerto del Rosario on the number 3, then the number 6 bus to Corralejo. The journey is quite pleasant, going through some interesting villages. As you get close to Corralejo to your left you will see the Caderilla de Roja, which is one of the extinct volcanoes that created these islands, and to the right some lovely sandy beaches that stretch up most of the coast to Corralejo. If you are staying in El Cotillo, you can catch the number 8 bus from Corralejo, or the number 7 from Puerto del Rosario. Corralejo´s location on Fuerteventura means that it is well positioned for many sports activities. There are north and east facing beaches close by and this allows those who enjoy surfing, windsurfing or kite boarding to move to spend their days in different locations depending upon how the wind is affecting the waves or blowing in relation to the shore. Those that are into hiking or mountain biking have a choice of off road tracks and the distances travelled can be adjusted to suit the time available. Besides trike tours, there are other possibilities including Buggy Tours and excursions as well as quad bike tours, and all of these prove popular with holidaymakers. 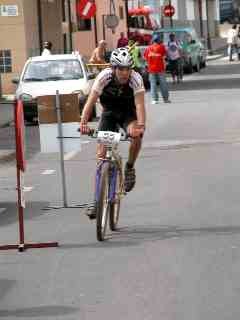 Arriving at the finish of the Fuertebike mountain bike race.